Like legions of gardeners across the country I'm always on the lookout for a tasty tomato to grow. The open-pollinated Malakhitovaya Shkatulka is my favorite from this summer's harvest - indeed, it's a real gem, true to its name. Typically, I vow to grow the tomatoes I love best from our harvest again next summer, then I end up growing varieties that are new to me. Often it's a matter of opportunity. I got the seeds for Malakhitovaya Shkatulka free at a seed swap last February, and the photo looked so beautiful I just had to try it. I'd never heard of it and I struggle with its Russian name, but you can bet that I'll be saving the seeds to plant next year (at least that's my plan). It really is a gem, as its name suggests: Malakhitovaya Shkatulka means "malachite box" in Russian (Малахитовая Шкатулка). Malachite is a gem used for jewelry and at one time was also used to make jewelry boxes. 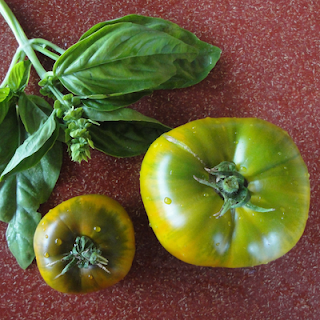 The tomatoes are large: my bigger ones reached 3/4 lb each, and have a beautiful green skin that is blushed with an apricot hue as they ripen. Another plus about this tomato is that it doesn't seem to mind mild summer weather as is typical in the San Francisco Bay Area, so growing Russian tomatoes in the cooler parts of the US makes sense. This tomato has a very satisfying tomatoey flavor in line with other low acid varieties, such as Brandywine. 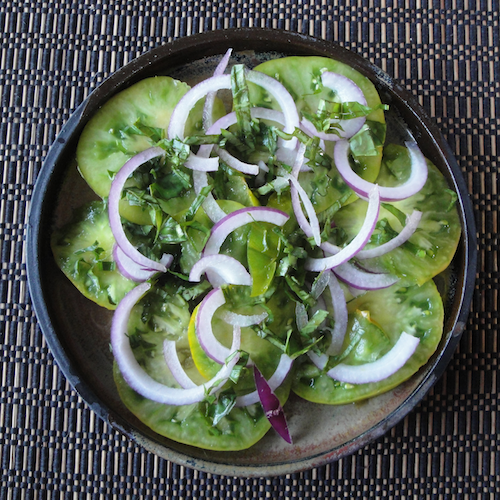 I think another of its outstanding features is the gorgeous color, especially in a simple sliced tomato salad with red onion, fresh basil and a drizzle of olive oil and balsamic vinegar. That's what I use as a taste-test standard and the first thing I eat every summer with my freshly ripened garden tomatoes. 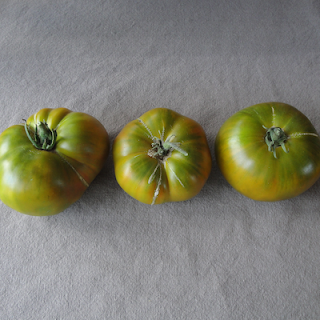 This particular variety appears to have come to the US in 2007 according Tatiana's TOMATObase web site. Tatiana Kouchnarev acquired the seeds from Tamara Yaschenko of Biysk, Siberia, Russia, in 2006 in a seed exchange. Tatiana in turn offered it in the 2007 Seed Savers Exchange Yearbook, where it was then requested by Jere Gettle of Baker CreekHeirloom Seeds, and it was offered in the 2008 catalog. Gettle brought it to the EcoFarm seed swap last February, where I snagged a packet and grew it this summer. The tomato originated in Russia at Svetlana Farm. A dizzying number of tomatoes of many colors, shapes and sizes are available to the home gardener who is willing to grow from seed. Have you grown this tomato before? Would you grow it again, and where are you located? 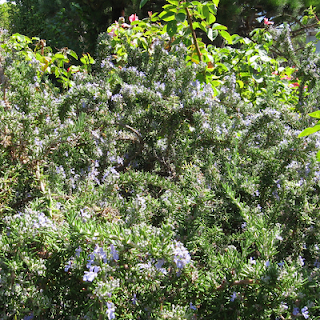 Replacing an old juniper hedge with a beautiful flowering, edible rosemary hedge that bees love is a good thing, right? In my sustainability analysis I'm surprised at my conclusions, but at peace with my decision. Sustainable gardening puts to use the principles of sustainability, and there is actually a document to point to for these so called Hannover Principles, also known as, a "Bill of Rights for the Planet", which are used as guidelines. They are credited to William McDonnell Architects and were developed for an EXPO held in Hannover, Germany. Recently I had a chance to apply these principles to my hedge replacement plan. I took a short course on sustainable practices through my horticultural program this summer and it was a good eye-opener that got me thinking deeper about my own approach to gardening. I have to give credit to instructor Frank Niccoli, a sustainable landscaper who teaches in my Environmental Horticulture and Design program. We inherited the junipers when we bought our suburban home, and I've never found them attractive, in fact they irritate me. They don't flower, they are prickly, and I don't like their odor. They are leftovers of gardening practices popular in the 50's and came with our house. In contrast, rosemary is an attractive shrub with lovely sky blue to purple flowers that attract bees, has a wonderful fragrance, is useful in the kitchen and can be pruned into a hedge. It's also drought tolerant. On the surface it seems like an obvious decision to go ahead with my replacement scheme. But I applied sustainable principles in analyzing my plan and I was surprised at my conclusions. See if you agree. 1. Pay someone to take out a row several feet long of these shrubs. 2. Pay to have the roots removed so that I could plant something in their place; leaving any roots means they might grow back. 3. Pay to have the waste from the shrubs be disposed of at the dump, because they cannot be used for mulch. 4. The energy use involved in removal and transportation to the dump are costs to the environment (pollution and use of petroleum based non-renewal energy). 5. The truckload of yard waste is needlessly adding to the landfill, which is a societal cost, since garbage keeps coming, but landfill space is limited. 1. The juniper shrubs have the advantage of being drought tolerant which is very important in my dry California climate. 2. There are currently no monetary or environmental costs to keeping the juniper hedge as is (I've been hand-pruning for the past several years). Sadly for my rosemary hedge fantasy, the resources required to replace the junipers with something I happen to like better far out weigh the benefits. Part of the equation is that I already have several rosemary bushes that provide herbs for my kitchen and flowers for bees. I also grow a profusion of other herbs and flowering plants that benefit my garden ecosystem. - Carol Franklin, Andropogan Associates LTD.
A sustainable approach to gardening and to our lifestyles in general, means that we take a global approach to everything we do by weighing the impacts. For the gardener this means that we consider the inputs and the outputs of our home gardening practices. This simply means that a minimum, we think carefully about the types of plants that we grow and landscape with, fertilizers we use, and what we do with garden waste. In my test case the arguments in favor of replacing the juniper hedge with pollinator-attracting rosemary are weak when considered in the context of my particular garden. Therefore, the junipers will live to see another day and having realized the real costs, it's a decision I can live with.